Catherine de Medici was one of history’s most powerful and ruthless queens. In this novel, C.W. Gortner paints a picture of her life that is a bit more sympathetic than most. Catherine was orphaned as a young child, and is almost killed herself in her native Florence, before being betrothed at age thirteen to Henri, son of Francois I of France, and while she becomes queen, she is overshadowed by her husband’s mistress, who rules him as well as his kingdom in private. But when Catherine is widowed at forty, she is in charge of not only her six children, but of the entire kingdom of France as well, eventually giving advice to three of her sons as they all become king in succession. Catherine uses wit, cunning, and a bit of magic to secure her family’s rightful place as the rulers of France. I really love historical fiction, but I can be somewhat picky about it, and thus far, C.W. Gortner has not failed me. As in his first book, The Last Queen [my review], with The Confessions of Catherine de Medici he has taken an infamous woman of history and brought her to life, told her story through her own eyes, and made her a much more sympathetic character for the reader. I loved every minute I spent with Catherine, and as the book progressed I liked her more and more, and felt more empathy towards her as I imagined how difficult it must have been for her, to go through everything she went through as a child and young woman. What I really loved about Catherine as a character was how much she took control of her own, and her family’s, destiny. Even when she had to make unpopular decisions, or stand up for what she believed in when no one else agreed with her, she did what she felt was right and necessary in order to secure her family’s future. Also, she truly believed in peace. She was never interested in fighting unnecessary wars or causing conflicts between the Catholics and the Hugenots – she truly wanted everyone to coexist peacefully. As she was one of the few people who had this goal in mind, it wasn’t so easy to secure, but I admired her for wanting to allow the Hugenots to practice their religion freely and for really trying to cultivate peaceful relationships between the two religions. 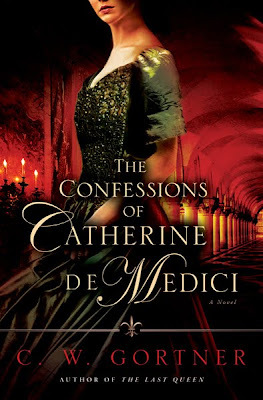 Not only did Gortner make Catherine de Medici come to live in this novel, he made absolutely everything come to life. Every word in this novel was chosen carefully so as to give the reader the full historical experience. The detailing was perfect, I felt like I was in France, in the royal palace, with these characters. The secondary characters were also very well-drawn and realistic, never one-dimensional as secondary characters can sometimes be. All of Catherine’s children had their own distinct personalities, and I loved how they were such a big part of the novel. And it was clear that Catherine would have done anything in the world to protect her children. I feel like I’m not being very concise with my thoughts here, because honestly I loved this novel to pieces and I do not know if I’m explaining that very well. C.W. Gortner is one of the best writers of historical fiction that I have come across, and I really hope he is feverishly writing his next book because I can’t wait to read anything else he writes! Rest assured, Christopher is definitely at work on at least two projects that I know of. Thanks for the lovely review of his book. When I get caught up in a story, I find it’s hard to write a review too, because I almost forget I am supposed to be remembering specific details as I go along. I’m glad you enjoyed Christopher’s latest. Yay! Glad you loved it…I’ve been looking forward to its release! Explained it just fine with “loved this novel to pieces” good enough for me! Great review! I loved Gortner’s recent works as well. and will always be a big fan. Thank you for this wonderful review and for your enthusiastic support of my work. I really appreciate it and I hope your readers will enjoy Catherine de Medici’s story as much as I enjoyed writing it. My husband knows so much about the de Medici family and he would be impressed if I read this and could add something to the conversation! I have read a few books about Medici family, the House of Medici: its rise and fall by Christopher Hibbert is one of these few books. BTW, I just downloaded to my Kindle. I know I’ll enjoy reading it. Thank you so much for putting out such a well-written, high quality book review!